iFunny aims at delivering you a daily dose of fun with funny pictures from the internet. But when you’re not using the service anymore, you might be considering to close your account. In that case: In need to bring you so bad news because, as you can see below, their customer service team, explains in an email that there’s no way to delete your account. So all we can do is remove the app itself. 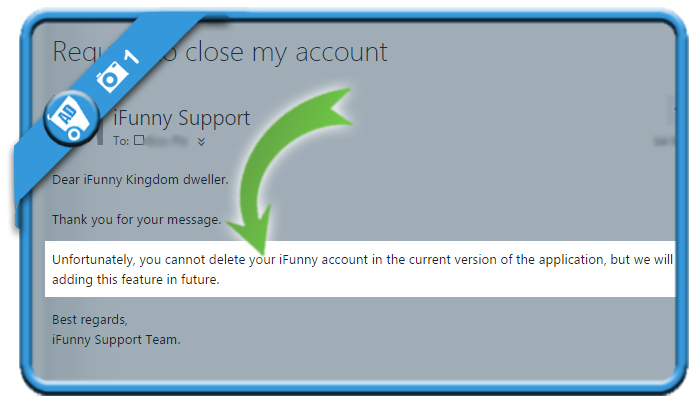 I received the answer that you cannot delete your iFunny account in the current version of the application (27/08/2015), but that they will consider adding this feature in the future. is remove the app from your device like you would do with any other iOs or Android app. Now that we know that it’s impossible to delete the account, the best second thing we could do is remove the app itself. That way we won’t receive any more messages or notifications at all.